The book is in chapters by era from the mid-nineteenth century to present. 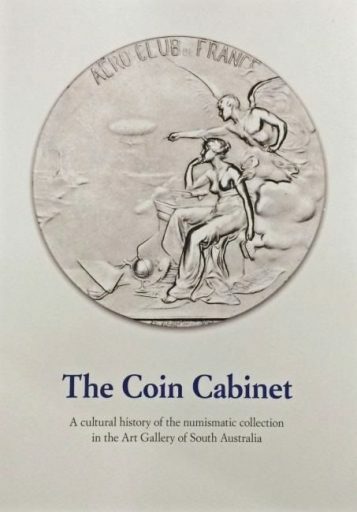 It delves into the impact of the social circumstances of the day, the personalities of the curators and details of donors, day to day life in the coin room, examples of acquisitions, exchanges, publications used and sometimes contributed to, and much more. The book tells why and who led a movement a little over a century ago to transfer the collection from the South Australian Museum to the Art Gallery. The author, has been interested in numismatics for over 50 years, and has won four prestigious numismatic writing awards. In 2017 Peter won the Art Gallery of South Australia’s Volunteer of the Year Award in recognition of extraordinary service. with Peter Lane’s new book. It is full of life and interest. curators, as well as prominent benefactors and local identities of the times, add great depth to the tale and bring these “names” alive. Just finished reading The Coin Cabinet. I can hardly believe what a monumental,opus this is! It reveals important previously unpublished numismatic information,,brings the characters involved in the drama to life, as well as being a damned good,read. The book is wonderful, I had a good noodle through it today, it’s beautifully produced and entertainingly written – even a non-numismatist such as myself enjoyed it. The Coin Cabinet is the first comprehensive survey of the highlights of the collection. Not,only does the author provide numismatically detailed information for the purists, but he contextualises it in a socio-historic context to make it of interest to both students of history,and culture alike. Given the three years of research and the lifetime of knowledge utilised in the creation of this,work, the fact it is only being sold for $50.00 seems a trifling sum.